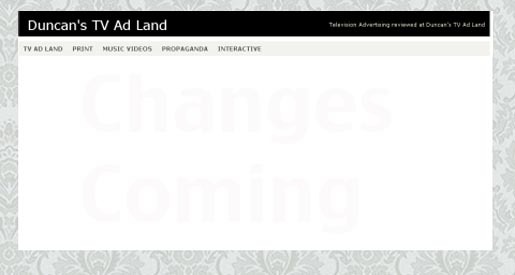 Duncan’s TV Ad Land is currently going through a makeover. Here’s a few of the changes you’ll find if visiting the site…. I’ve put together Duncan’s TV Ad Land, Duncan’s Print, Duncan’s Music Videos, Duncan’s Interactive and Duncan’s Politics. Five blogs is just too many to manage. I developed each separately, as I wanted to keep this one focused on television advertising. However I’ve come to the conclusion that celebrating excellence and inspiration from the creative industry is a focus that can combine all of these. The subdomains will stay put for a few weeks while I adjust the newly imported posts here at www.duncans.tv, which mostly involves setting up new directories for image files. I’ve reduced the number of categories to just the genres – TV Ads, Print, Music Videos, Interactive and Movie Trailers. There’s yet the possibility of Short Film. I’ve changed the default category of Advertising to Inspiration. I’ve upgraded my Feedburner RSS account to allow for daily emails with summaries of the posts of the day. I’m not sure about ‘best’ but Jai’s design includes a feature under the About Me section with the posts that have attracted the most comments. I’ve replaced the Google search engine with a WordPress-driven search facility. With the transition to one blog I needed a more reliable connection with all the posts here. I’ll be continuing to post often here – on an average of four to five posts a day at the moment. I’m also spending a couple of hours each night going through posts cleaning them up, removing eminimalls, changing headings formats, ensuring some consistency in tags. However I’m interested in any other suggestions or feedback about the new design. Are ten posts too many to have on the front page? What about YouTube? Is it working for you? I’m exploring the possibility of a new video player format.